Facebook is the world’s most popular website, with approximately 1.6bn users and generating an overall revenue of $5.1bn in 2012. This has meant that not only has the social network become a favourite with consumers, but marketing professionals also quickly realised that it’s a great resource for digital marketing. Facebook was founded in 2004 by the now world-famous Mark Zuckerberg, along with Eduardo Saverin, Andrew McCollum, Dustin Moskovitz and Chris Hughes. However, Zuckerberg is the only one who still has a controlling interest in the company. 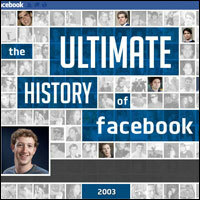 Briefly, the site began as a ‘hot or not’ comparison site at Harvard University until it later became thefacebook.com and finally plain Facebook. By 2005, the site usage had spread to include many of the colleges in the USA and a school version was launched before finally opening to the rest of the world in 2006. The rest, to coin a cliché, is history. By the back end of 2007, Facebook had around 100,000 business pages and it was announced that Microsoft had purchased a share of 1.6% of Facebook for $240m; part of this deal was the right for Microsoft to place international ads on the site. In September 2006, Newsfeed was introduced, to be followed later that year by the ‘Share’ feature, and by 2009 the site had users all over the world. Before this however, the site introduced new features geared towards advertisers. 2007 – $240m deal with Microsoft for ad banner syndication; virtual gift shop; marketplace app for advertisers; applications platform with around 85 apps; advertiser opt-out feature; Facebook Ads for business, ad system ‘Beacon’ allows brand names to go viral; Facebook Chat and Facebook Connect are all introduced. As the timeline makes clear, Facebook has to some extent always been interested in attracting advertisers. Has it been successful in doing so? Yes, to some extent, but not as yet on the same scale as Google, to date. Whilst the site is said to have a lower CTR than other major websites when it comes to banner advertising, the site can congratulate itself on the overall way that it has helped to shape modern digital marketing. Currently the site’s revenue accounts for around 86% of its overall revenue. Pages in particular have encouraged people to engage with brands much the same as they would a friend on the social network. Whilst in the past it’s safe to say that advertisers help the power, Facebook has made it so that consumers now have the power. This is due to the fact that so many people recommend a brand to a friend on the site, rather than relying on advertisements. Brands that get this right can quickly find their content going viral and this is through have conversations, rather than older advertising models where no two-way communication could be initiated. However, that’s not to say that ads on Facebook are ineffective, it’s just brought about a different kind of marketing, which is much more customer-centric. It’s not just Facebook that has enabled this of course, Twitter, LinkedIn and more recently Pinterest (to name a few) have all contributed to changing the face of advertising. One of the most important aspects of this is now ‘brand personality’, which, whilst it was important before, is now more central to a campaign. Ensuring that consumers can engage with a brand is not particularly easy, but very effective if done well. This also helps marketers to really address their target audience, rather than just putting out a blanket ad that will be seen by many. This alongside techniques such as email personalisation and SEO can make for an extremely effective marketing campaign. Effectively then, Facebook and social has changed not only digital advertising, but businesses too. It’s safe to say that the onset of smartphones and their popularity is going to have a huge impact on social marketing and this is where Facebook are attempting to take their next steps. The recent introduction of the new Timeline means that they continue to look at advertising models and with larger images, this even looks better on the site’s much-maligned app, which has recently been updated. Of course, there is also Facebook Home, which is geared towards making Facebook the central point of a smartphone, rather than the original operating system. By creating more room and optimising images, Facebook have made a start on making sure the mobile platform has space for advertising, especially with the way that Sponsored Stories and Suggested Pages now appear in Newsfeed. Digital marketing is still undergoing a transformation and the step onto mobile is already taking place, from corporate video, video infographics, in-app advertising and more rising in popularity swiftly. MySocialAgency is a digital marketing agency with teams in Leeds and London. Get in touch today to learn more about our services.